Imaam Ibnul Qayyim [rahimahullaah] said: Righteousness of the heart and its steadfastness upon the path leading to Allaah’s [good pleasure etc] depends on its complete devotion to Allaah [The Most High]. 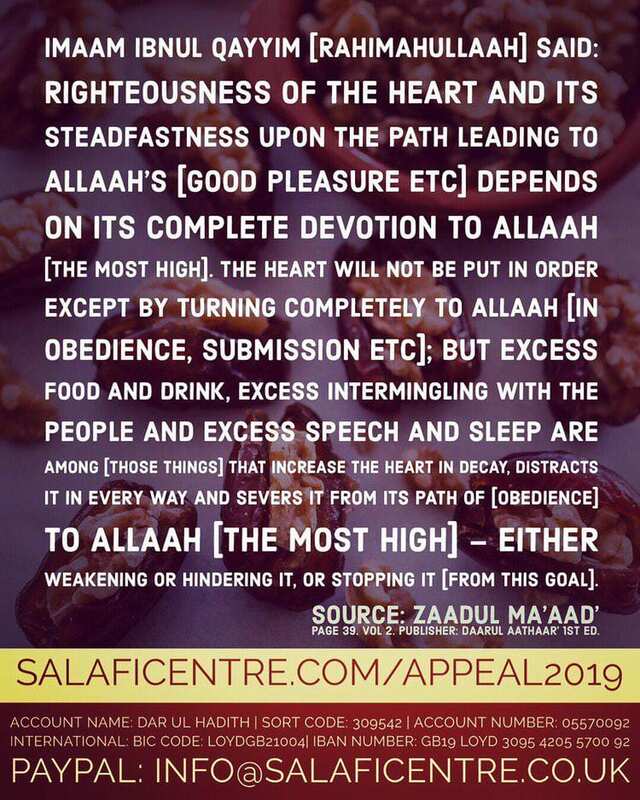 The heart will not be put in order except by turning completely to Allaah [in obedience, submission etc]; but excess food and drink, excess intermingling with the people and excess speech and sleep are among [those things] that increase the heart in decay, distracts it in every way and severs it from its path of [obedience] to Allaah [The Most High] – either weakening or hindering it, or stopping it [from this goal]. Therefore, Allaah’s Mercy necessitates that fasting is legislated for the [believing] servants in order to [divert them] from excess food and drink, and rid the heart of the intrusions of desires, which hinders it from its path [of obedience] to Allaah. Allaah legislated [fasting] in accordance with what is of benefit for the servant, so that the servant is benefited in his worldly life and afterlife – neither hindering him from what will bring about well-being for him in this life nor in the afterlife. Source: Zaadul Ma’aad’ with annotations by Imaam Abdul Bin Abdul Azeez Bin Baaz & Checking of the Ahaadeeth by Imaam Albaani (rahimahumallaah). Page 39. Vol 2. Publisher: Daarul Aathaar’ 1st ed. ISBN Number: 2005/9441.